The flight plan called for the crew to board the Soyuz MS-09/55S spacecraft and seal the hatch around 5:20 p.m. EST, undocking from the space station’s Earth-facing Rassvet module at 8:40 p.m.
After moving a safe distance away, Prokopyev and Gerst plan to monitor a planned four-minute 37-second rocket firing starting at 11:10 p.m., slowing the ship by about 286 mph to lower the far side of the orbit into the atmosphere for a descent to the steppe of Kazakhstan. If all goes well, the spacecraft’s central descent module, the section of the spacecraft carrying the crew, will make a parachute-and-rocket-assisted touchdown near the town of Dzhezkazgan, Kazakhstan, around 12:03 a.m. Thursday (11:03 a.m. local time). With up to four inches of snow in the area, Russian recovery crews and medical personnel, along with U.S. and European Space Agency support teams, will be stationed nearby to help the returning crew members out of the cramped crew compartment as they begin their re-adaptation to gravity six months after launch from the Baikonur Cosmodrome on June 6. With touchdown, Prokopyev and Auñón-Chancellor will have logged 196 days 17 hours and 51 minutes off the planet during their first space mission while Gerst, veteran of a 165-day stay aboard the station in 2014, will have nearly a full year of cumulative time aloft. After brief medical checks and satellite phone calls home to friends and family, Prokopyev, Gerst and Auñón-Chancellor will be flown by helicopter to Dzhezkazgan for an official welcome home ceremony. Prokopyev then will head back to Star City near Moscow while Gerst heads for Cologne, Germany. Auñón-Chancellor will return to her home near the Johnson Space Center in Houston. “At first when you get up here you’re sort of this ungraceful ballerina who can’t manage anything … but this is my favorite part,” she said, turning a slow flip aboard the station. “It lets you work in three dimensions, and you just realize what your body’s able to accomplish up here that you just don’t do on Earth. Left behind in orbit with the departure of the Soyuz MS-09 crew will be Expedition 58 commander Oleg Kononenko, Canadian astronaut David Saint-Jacques and NASA astronaut Anne McClain. They originally expected to launch last week, joining cosmonaut Alexey Ovchinin and Nick Hague aboard the station. But Ovchinin and Hague were victims of a launch abort Oct. 11, the first for a Soyuz spacecraft since 1983. Instead of reaching the station and joining Gerst, Prokopyev and Auñón-Chancellor, Ovchinin and Hague were forced to make an emergency landing near Dzhezkazgan, throwing a wrench into the carefully planned crew rotation schedule. Russian engineers quickly traced the problem to the system used to control the separation of the four liquid-fueled strap-on boosters making up the Soyuz FG booster’s first stage. A fix was relatively straight forward. After assessing multiple options, Russian managers opted to move up launch of Kononenko’s crew from Dec. 20 to Dec. 3 and to delay the departure of Gerst and his crewmates from Dec. 13 to Dec. 20. Roscosmos, the Russian space agency, also moved up the next flight in the sequence. 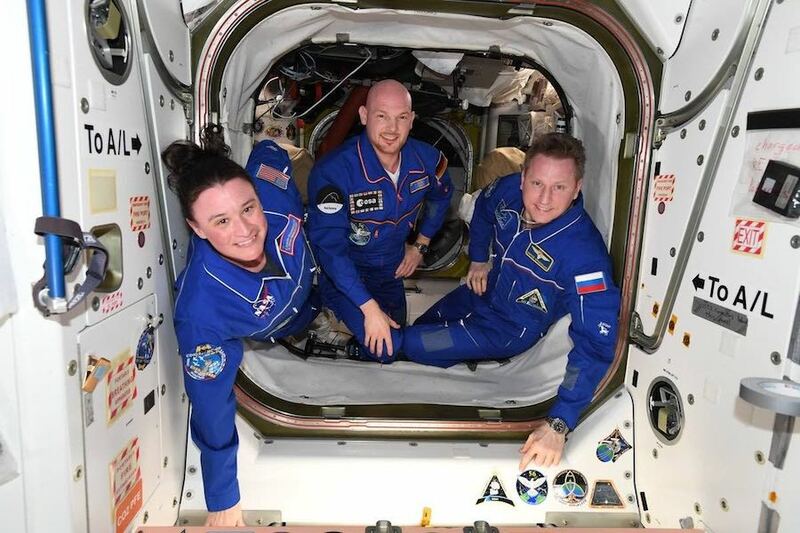 That mission, originally planned for early April, was to have carried Russian commander Oleg Skripochka, NASA astronaut Christina Koch and a United Arab Emirates guest astronaut to the station. Instead, Ovchinin and Hague will join Koch aboard the Soyuz MS-12/58S spacecraft, launching to the station at the end of February. In an interview with CBS News at his home in Houston, Hague said he had full confidence in the Soyuz’s safety systems and that he was looking forward to fulfilling his mission. His wife, Catie, agreed, but said she was still nervous about the idea of her husband riding a rocket into space. “I was very nervous (during the October launch), and I’m still nervous,” she said. “There’s risk, there’s a lot of risk with what they do, and to be on the outside of that looking in, where you have absolutely no control, is scary. It’s scary. It wasn’t just the Soyuz MS-10 spacecraft that gave the Russians problems. The Soyuz MS-09 ferry ship that Prokopyev, Gerst and Auñón-Chancellor are relying on for their trip home had trouble of its own last August when sensors aboard the station detected a slight drop in the lab’s air pressure. The leak was not deemed serious enough to wake the crew, but the next morning the four astronauts and two cosmonauts making up the Expedition 56 crew traced the leak to the upper “orbital” module of the Soyuz MS-09 spacecraft. Photographs of the hole that were downlinked by the station crew showed what appeared to be a drilled-out penetration in an interior panel with several nearby gouges like those that would be caused by a drill skipping across a surface before digging in. As one might expect, Drew Feustel, the commander of the station at the time, told interviewers his crew had nothing to do with the leak other than plugging it, and no one since then has suggested the possibility of any such involvement. In any case, Prokopyev and fellow cosmonaut Oleg Artemyev, acting on instructions from the Russian mission control center, plugged the hole with gauze soaked in epoxy. The plug held, and flight controllers later boosted cabin air pressure back to normal levels. The crew was never in any danger, officials said, and a safe re-entry by the Soyuz MS-09 spacecraft has never been in question because of the leak. In a normal entry, the three modules making up a Soyuz spacecraft — the upper orbital section the crew compartment and the lower propulsion module — separate from each other just before falling back into the discernible atmosphere. The upper and lower modules burn up while the descent module, the only one protected by a heat shield, continues on to touchdown. For the Soyuz MS-09 entry, the crew planned to follow normal practice, closing the hatch to the upper module before departing the space station. Even if a leak opened back up, it would have no effect on the sealed-off descent module. But Russian engineers still wanted to inspect the exterior of the Soyuz’s orbital module to find out if any of the epoxy had made it all the way through the hole and to collect any clues that might be available on the exterior. By moving launch of Kononenko and his crewmates up to Dec. 3, and delaying the departure of the Gerst crew, the Russians ensured enough time with a full complement of crew members for a spacewalk by Prokopyev and Kononenko to do just that. The cosmonauts ventured outside the station on Dec. 11 and cut through insulation and micrometeoroid shielding on the orbital revealing the site of the leak. They collected samples of the extruded epoxy and any chemical traces on the hull near the hole that will be returned to Earth for laboratory analysis.